Rabbit anti Chicken, Human, Mouse, Rat MMP-9. Product is tested for Enzyme Immunoassay, Immunoprecipitation, Paraffin Sections, Western blot / Immunoblot. A synthetic peptide corresponding to the hinge region of human MMP9. 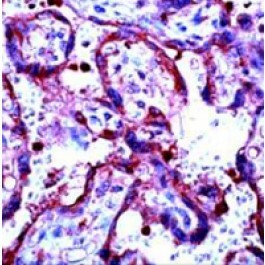 Rabbit polyclonal antibody raised against synthetic peptide of MMP9. This antibody recognizes ~92 kDa of human MMP-9 protein.